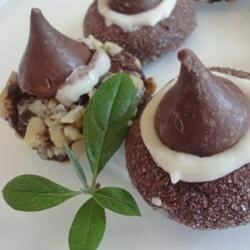 "A chocolate cookie that is rolled in nuts, with thumbprint filled with white icing and topped with a chocolate kiss." Beat 1/2 cup butter or margarine, white sugar, egg yolk, 2 tablespoons milk and 1 teaspoon vanilla until light and fluffy. Combine flour, cocoa and salt; gradually add to butter mixture. Cover and chill 1 hour or until firm enough to roll into balls. Meanwhile, in a small bowl, lightly beat egg white. Shape dough into 1 inch balls; dip in egg white, then roll in nuts. Place on greased baking sheets. Make an indentation with thumb in center of each cookie. Bake for 10-12 minutes or until center is set. To Make the Filling: In a small bowl, combine 1/2 cup confectioner's sugar, 1 tablespoon of butter or margarine, 2 teaspoons of milk and 1/4 teaspoon of vanilla extract. Mix until smooth. Spoon 1/4 teaspoon of the filling into each warm cookie; gently press a chocolate kiss (unwrapped) in the center. Carefully remove from baking sheet to wire racks to cool. See how to make chocolate cookies coated in confectioners' sugar. A good chocolate cookie. I was looking for a chocolate cookie that I could add my peanut M&M's to and this worked perfectly minus the nuts and confection filling.